Delhi-based Oberoi Group, which was founded in 1934, is a multi-business conglomerate with assets in hotels, corporate air charters, travel and tour services, airport restaurants and flight catering, consulting services, car rentals ... and cruise travel. Most of the public associates Oberoi with the eponymous string of luxury hotels located primarily in India, Malaysia, Mauritius and Egypt. The group also operates Trident Hotels, typically upscale business-oriented hotels in India and in Saudi Arabia. Oberoi prides itself on its impeccably trained staff in all of its ventures, guaranteeing the highest level of service. Refurbished in 2016, the replicate steamwheeler river boat carries on the luxury associated with the Oberoi brand and carries a maximum of 44 passengers. Passengers on any of Oberoi Cruise's three boats can expect impeccable service and Continental/regional cuisine by creative, award-winning chefs. The company regards their cruisers as an extension of their hotel operations, which has garnered accolades from every corner of the world. Little touches, like bathrobes and slippers, Wi-Fi and coffee/tea-makers in the staterooms, set this line apart. Passengers can bring children, but there are no facilities specifically for them on any of the boats. Each voyage is inclusive of shore excursions, meals, entertainment and enrichment programs. Alcoholic beverages are not included with the cruise tariff and must be purchased separately. Each vessel has a wine list and a stocked bar and/or lounge. Oberoi Philae, Nile Cruiser, has a more formal atmosphere for supper than the other vessels, with fine china, crystal and crisp white linens adorning the dining room. Oberoi Vrinda provides the most casual atmosphere. Dress onboard all the boats is casual during the day and "country-club casual" in the evenings. Breakfast and lunch onboard is usually buffet-style, there is an afternoon tea, and supper can be either a themed buffet or a la carte single-seating depending on the boat, the route and the evening. Local entertainers are often brought onboard in the evenings; on occasion, a theme party is open to passengers (Egyptian dress, Black and White). The two Nile River cruisers have fitness centers; Oberoi Zahra, Luxury Nile Cruiser, has a full-service spa. Expect a contingent of international retirees and boomers with both the time and the funds to pamper themselves in luxurious surroundings as they explore the Nile in Egypt or the Kerala region of India. The onboard ambiance is one of genteel elegance; those familiar with the Oberoi name in hotels will expect nothing less than a replication of the hotel experience, which is what The Oberoi Cruise promises. Oberoi's cruise division operates three river boats; two are Nile River cruisers and one is located in Kerala, India. Oberoi Vrinda is a 16-passenger vessel that cruises the backwaters around Kerala, on Vembanad Lake. The cruise itself is three nights, but the itinerary includes one night in Cochin prior to boarding the vessel. The small boat is furnished in an elegant colonial style with rich dark woods and panoramic windows. Each passenger cabin faces the water, has a king bed, en suite bath, air conditioning and television with DVD player. An indoor/outdoor dining room is featured, as well as a bar and top-deck grill. The award-winning Oberoi Philae, Nile Cruiser was built in 1995. Designed to replicate a river sternwheeler, the 112-passenger vessel is charming and luxurious, with plush furnishings, ornate ironwork and a top-deck pool. Each large stateroom has a furnished balcony, air conditioning, television with DVD player and an en suite bathroom. Four elegant suites also have a separate sitting room and loungers for their private terrace. Public rooms include a library, formal restaurant, lounge/bar, small fitness center, hair salon and boutique. Oberoi Zahra, Luxury Nile Cruiser, debuted in 2007. In a departure from its siblings, both of which convey "old world charm," this vessel is sleek and modern inside and out. With the profile of an enormous contemporary yacht, its interiors are minimalist and muted. Huge windows in both the staterooms and bathrooms frame the river; the two luxury suites also have private terraces with individual hot tubs. Other cabin amenities include air conditioning, bathrobes and slippers, televisions with DVD players, bathrobes and slippers, Wi-Fi and a coffee/tea maker. This is the only boat on the Nile with a full-service spa; there's also a pool on the top deck. Oberoi Motor Vessel Vrinda is situated on Vembanad Lake in the Kerala region of India. The cruise itself is three nights, but itineraries are inclusive of four nights because of an origination stay in Cochin prior to boarding the vessel. Meandering through "the backwaters," the voyage includes the Alleppey canal, Kanjippadam, Chambakulam and Nedumudy, some of which occurs with a transfer to a traditional rice boat, which is more able to navigate the backwaters. 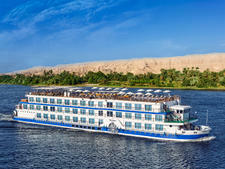 Both Oberoi Philae, Nile Cruiser and Oberoi Zahra, Luxury Nile Cruiser travel from Luxor to Aswan and return. Oberoi Philae, Nile Cruiser sails four- and six-night journeys along the Nile, while Oberoi Zahra, Luxury Nile Cruiser sails for seven nights. The itineraries include stops at The Valley of the Kings, Colossi at Memnon, Karnak and Luxor temples, the High Dam, the Old Dam, Edfu and Komombo. Shore excursions with trained Egyptologists are included in the cruise tariff.